The City of Delaware Fire Department held a burn training exercise Monday inside a couple of houses on Stratford Road along U.S. 23. Capt. 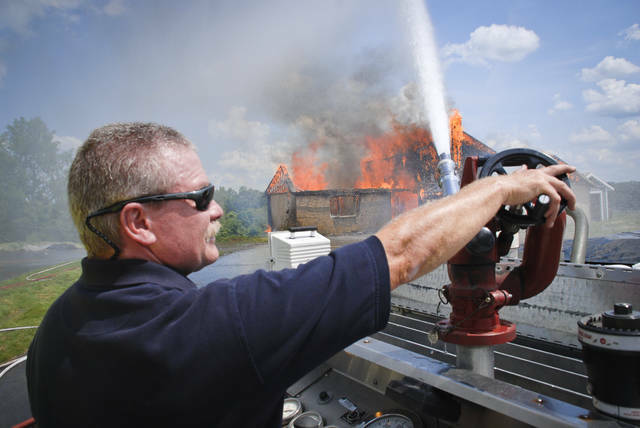 Jim Oberle of the Delaware Fire Department works the controls of a fire nozzle on the back of a tanker truck spraying the engulfed house to control the burn process. Or it could be a simple burn training being conducted by the Delaware Fire Department. Firefighters conducted the exercise in empty houses on Stratford Road along U.S. 23, at the site of the proposed Coughlin’s Crossing. According to Capt. Jim Oberle of the Delaware Fire Department, there are a whole set of worries associated with working in the empty houses because the firefighters don’t control the fire the same way they do in a training facility. He said it takes hundreds of hours to prepare a building for a safe training fire. Oberle said the process the fire department has to go through to prepare a building for a burn is the same as any contractor who is going to demolish a building. He said there is a lot of leg work going into the preparation before fire departments can step onto the grounds. Oberle said once the burning starts firefighters only get about three hours of burn training time out of each building. Oberle said he and his team spent the last two weeks going through each of the buildings making sure the burn plans lined up with the building layout. Oberle said not only was the asbestos removed, but the building couldn’t be burned until the roofing shingles and the vinyl siding were removed. Oberle said the developer contacted the fire department about giving up the buildings for the burns. He said the the contractor is doing the department a favor and the department is doing the developer favor by disposing of the buildings. “It helps them, it helps us,” he said. The training didn’t only involve the Delaware fire department, they shared the experience with the Liberty Township Fire Department as well. However, last week Bowling Green State University used the houses for collapse building practice for the Certified Rescue Technician program. “Anytime we get a structure we try to share that with other departments,” said Matt Scarbury, Bowling Green State University’s Certified Rescue Technician instructor, last week when conducting the training. “Anytime there is a large event we all run mutual aid together. Scarbury said by sharing training opportunities it helps bring the different departments together. This entry was tagged Delaware Fire, Liberty Township, Oberle, Training. Bookmark the permalink.